What I want: this table, running shoes, SmartWool socks, and those linen towels we discussed before. What I will actually try to get: an electrician. UPDATE: Electrician is scheduled, shoes and socks are bought, and housewares remain under consideration. It exists. Does the (laudable) reduction in OPP population — laudable because pictures of it look like pictures of the Middle Passage — mean fewer people are kept in jail, or that they are just housed elsewhere? Brilliant texts you should read, and fundamental knowledge you should have. How the American university was killed, in five easy steps. What would you add, along these lines? Filed under What Is A Scholar? Even as amusement during a hurricane I did not have the patience to watch all of Lars von Trier’s 2011 film, although I did see the spectactular end. It reminded me of Tree of Life, which is from the same era, but I will say that this film is less meaningless than Tree of Life. 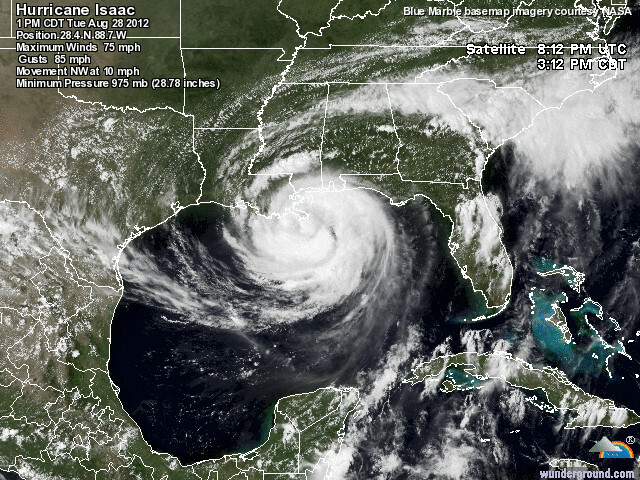 Isaac is downgraded to a tropical storm but it will stay another 30 hours or so, it seems, so we are still on watch. Last year around this time I had fairly serious roof damage, including interior wall damage from Lee which was also a mere tropical storm. In the past my typical hurricane roof damage cost under $700 and was covered by insurance. Now it costs $1500 and up and is not covered by insurance. On average, I get roof damage every other year, nowadays. I think this is because we are having more and stronger storms. I thought that since 2005 no homeowners’ insurance policies in Louisiana covered wind or rain damage from a named storm, but it appears that there is a Horace Mann agency in Opelousas which does sell such coverage. Do you know of any others? It is a hurricane now, and I find I am proud it has attained this new title! It is as though it had gotten married, or finished another degree. I am in the outer bands. The circular wind is getting stronger. I am not interested in a disaster or in investing as much thought as has been invested in a mere tropical storm. I hope it stays as it is, a jaunty little hurricane. This goes on in so many FL departments still. If you are not an X, you cannot possibly understand X. If you are an X, you are naturally an expert in X. Incidentally, this means that X cannot be a scholarly field. I remember this. As though these were evidence people voiced projections and prejudices, and then used the word “perhaps.” The same word was suggested to accompany actual data. Thus did these philologists remain in their rooms, smoke their pipes, and call it scholarship. –Denis de Rougemont, Love in the Western World, 1956-57 edition revised and augmented, p. 70. Is he not amusing? I am relieved somehow to realize he had to put up with these things, and delighted that he made these biting comments. Filed under Banes, Da Whiteman, What Is A Scholar?